Hey guys! This is my first post in the World of Coin forum. I have been a world coin collector since I was a kid but have been concentrating on US coins for a while. This has been my first Indian gold coin purchase. 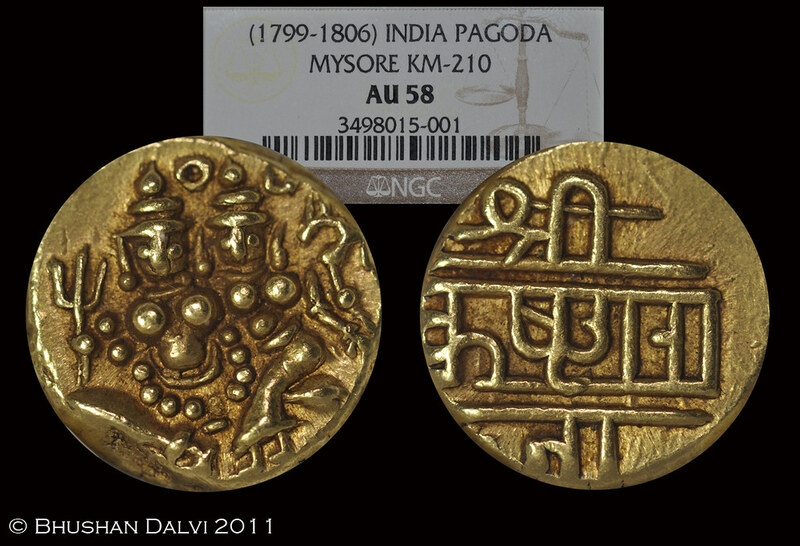 I am particularly interested in Indian coins mostly Maratha Empire coinage.This Indian gold pagoda coin I believe is fairly common. Any advice on collecting these is welcome. Let me know what you guys think about this one. Welcome aboard. Any gold coin is a nice coin lol. The Maratha's are interesting and there is a lot of research that still needs doing. Really wonderful coin and Pagoda coins are always a favourite collection coins of any collector. WELCOME TO WOC , BHUSHAN . THIS FORUM IS VIBRANT AND FULL OF ENERGY EACH MEMBER IS CONTRIBUTING AND GAINING EVERY DAY , HOPE YOU TOO WILL ENJOY THE SAME. An excellent and well struck spicemen. An highlight in a collection! Thanks a lot for the warm welcome guys. Aan09 thanks for the link. Oesho, thanks for boosting my confidence in this coin. I was really hesitant to buy it initially but decided to buy it after some research. I am still not very confident buying these raw. Are fakes common in this series? The essence of good buying is knowledge and trust in the supplier. The first takes research the second some luck and good guidance from others. Many coins even very cheap ones are faked but following the two thoughts I have described will generally keep you safe. I completely agree with you on these points. I have been reading through the old posts here and it has been a very good learning experience. I plan to build on my collection slowly as I gain more knowledge. If you are interested in Maratha coins, you will find a lot of useful data and a good catalogue in 'Mints and Coins of ther Marathas' (or something like that) by Maheshwari and Wiggins, and it was recently re-published by Reesha Books at Nasik. It is also usually available second-hand. Very few mistakes or omissions, except for recent discoveries, for which you need articles by S Bhandare in the Journal of the ONS, details from Stan Goron and online. Good luck - it is a fascinating subject. Salvete, thanks a lot for suggestions. I have been trying to find the Maheshwari and Wiggins book for a month now through my dad whose in Mumbai but it has remained elusive. You can find the book in the U of TX library in Austin. Your local library may be able to get it for you.